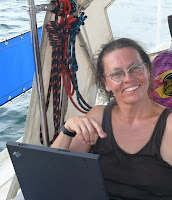 With a first entry to her archive on 1 October 2004, Ariane has been blogging longer than myself* - and she's been doing so from a world trip on a boat called Suleika! 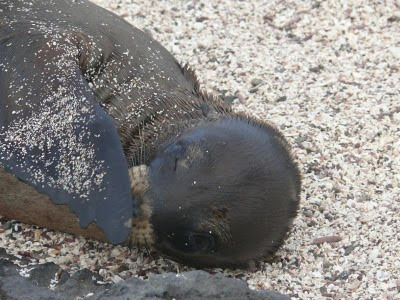 Follow the jump below to find out how blogging from a sail boat works and what technical difficulties might arise on the open sea, or just to take a look at the cutest seal ever. *I took it up in Malaysia in the spring of 2005. 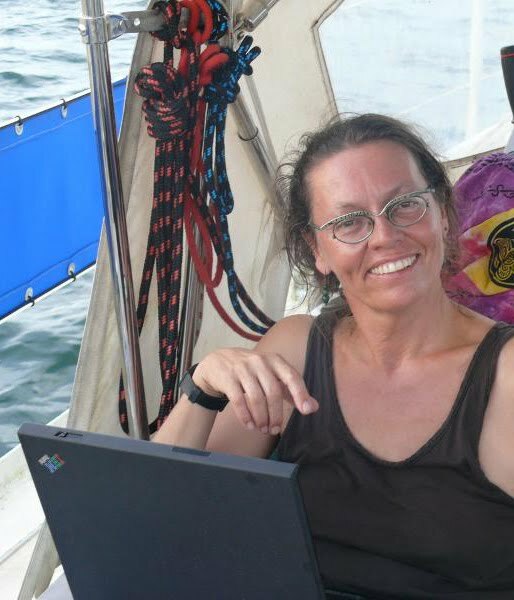 My name is Ariane Fürer Landolt, I am 49 years old and I am currently sailing around the world. We, my husband, Martin Landolt, and I, have started our homepage when we left Switzerland. We wanted to share our experiences and discoveries with our loved-ones at home. The homepage is called www.suleika.ch. Our sailing boat is called Suleika, so that explains why. Every ten to twenty days I recap what we did. Be it sailing or getting to know people, manners and countries. Family, friends, and everyone else who is interested in foreign countries and sailing. Also people who are dreaming of a trip around the world themselves. My husband Martin came up with the concept for the layout. The graphic design was done by DEKOGRAFIK in Schwerzenbach, Switzerland, owned by Monika Ramseier. It cost CHF 500.- at the time. The whole thing is based on HTML and running on Linux, which I can recommend. Photos play an important role on my blog, but I don't post MP3 or video clips. Here's photo 24 of record 27 - a blinking seal. We've got around 170 daily readers. I'm happy with that number as it is. It's nice to know that so many people are interested in the stories I tell. As we have a genius webmaster in Switzerland, my sister in law Dorothee Landolt, I never had to learn anything and thus can't pass on any advice. No, I've never made negative experiences with blogging. I never use Twitter. I had never heard of it before we left and these days out internet connection is usually very slow and/ or unstable, so that I'm happy whenever I can update the homepage or send and receive email at all. I'd like to recommend Wordsonawatch.blogspot.com. I'm interested in the author's professional development and her literary work. She's very dear to my heart. Ich heisse Ariane Fürer Landolt, bin 49 Jahre alt und bin dabei, die Welt zu umsegeln. Wir, mein Mann, Martin Landolt, und ich, haben unsere Homepage ins Leben gerufen, als wir die Schweiz verliessen, damit unsere Lieben daheim an unseren Erfahrungen und Entdeckungen teilnehmen können. Die Homepage heisst www.suleika.ch. Unser Segelschiff heisst Suleika, womit die Namensgebung klar sein dürfte. Im Abstand von zehn bis zwanzig Tagen mache ich einen Rückblick über die Sachen, die wir unterwegs erleben. Sei es beim Segeln, sei es beim Entdecken neuer Menschen, Sitten und Länder. Zielgruppen sind die Familie, die Freunde und einfach jeder, der sich für fremde Länder und fürs Segeln interessiert, oder auch von der grossen Reise träumt. Das Konzept des Layouts ist von meinem Mann, Martin Landolt. Die Grafik ist von DEKOGRAFIK in Schwerzenbach, Inhaberin Monika Ramseier, und hat CHF 500.- gekostet. Das Ganze basiert auf HTML und läuft auf Linux. Kann ich sehr empfehlen. Auf meinem Blog spielen Fotos eine grosse Rolle, MP3-Dateien und Videoclips kommen nicht vor. Bericht 124 Foto 24 – Seehund, der ein Auge zukneift. Unsere Webseite hat ca. 170 Leser täglich. Diese Zahl freut mich, so wie sie ist. Es ist ein gutes Gefühl zu wissen, dass sich so viele Menschen dafür interessieren, was ich erzähle. Da wir eine geniale Webmasterin in der Schweiz haben, meine Schwägerin, Dorothee Landolt, musste ich nichts lernen und kann daher keine Tipps weiter geben. Nein, ich habe mit dem Bloggen noch nie negative Erfahrungen gemacht. Ich benutze Twitter nie. Es war mir unbekannt, als wir verreist sind und unterwegs ist der Internetzugang oft so langsam und/oder unsicher, dass ich froh bin, wenn ich die Homepage updaten und die Mails schreiben und empfangen kann. Wordsonawatch.blogspot.com kann ich sehr empfehlen. Ich interessiere mich für die neuste Entwicklung der Autorin und ihr literarisches Schaffen. Diese junge Frau liegt mir sehr am Herzen. Mich berührt vor allem die Antwort auf die letzte Frage.